Manchester City right-back Kyle Walker couldn’t resist mocking Manchester United winger and fellow England international Jesse Lingard this evening. 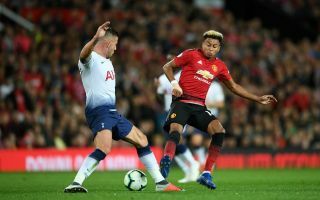 See the tweet below as Walker posted a video of Lingard being savagely nutmegged by Juventus left-back Alex Sandro in the Champions League game in Turin. United did, of course, run out 2-1 winners on the night, so Lingard won’t be too bothered by this admittedly embarrassing moment.